Non vivo lavorare ma lavoro vivere. “I don’t live to work but work to live.” This is what Emmanuele, one of Charlotte’s Italian admirers, told us when she asked how he could stay out until 3 am (le ore piccole) and then go to work the next morning. Yesterday evening, the couple, who lives below my apartment, locked themselves out. I was happy to help them out by calling the landlord/manager, and they were soon let back in. While they waited, I served them up fried zucchini flowers, tomatoes with fresh mozzarella bufala, and olive ascolane (a special meat-stuffed, fried olive that is from the Ascoli Piceno region). My neighbors are a cute American couple: Jordan is the girl, and I forgot the boy’s name, but we went out for prosecco afterwards. The little bar/cafe right below my window is a great place to sit and talk, and there’s another wine bar a block away that they frequent. The boy is American but born to Iranians who fled just before the Shah was deposed. He lived in Tehran for several years when he was younger. They’ve been here two months taking the language program at my school for credit at UMass Boston. We were talking about how people here don’t seem stressed about what they’re going to do with their careers. They all seem so relaxed. In the shops and cafes, if you don’t have the exact amount for something, they’ll just give you fifty cents. Non ce problema. Even the careers we talk about in class are things like: barbiere, comessa (shopgirl), casalinga (housewife), giardino ( gardener), etc. They don’t seem obsessed with professions the way we are. 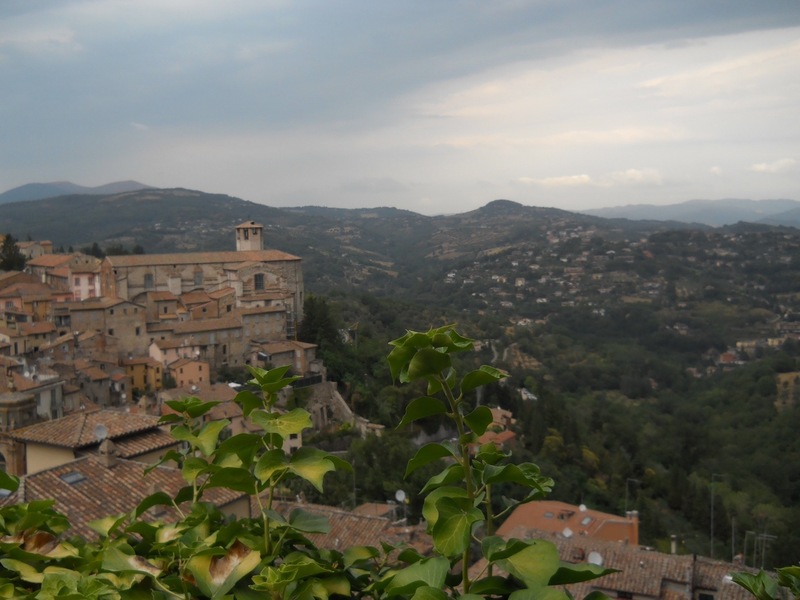 I know from the newspapers that their economy is in trouble, and they will tell you there are fewer tourists, even in places like Assisi, but they just seem to take things in stride. They have a way of living in the moment, and they don’t seem out to prove themselves or to be a big success. Anyway, my new friends really feel this, and kind of dread the questions of “What are you going to do with your degree? and why aren’t you studying Spanish?” when they go home. They just love Italy and wanted to learn Italian, just like me. 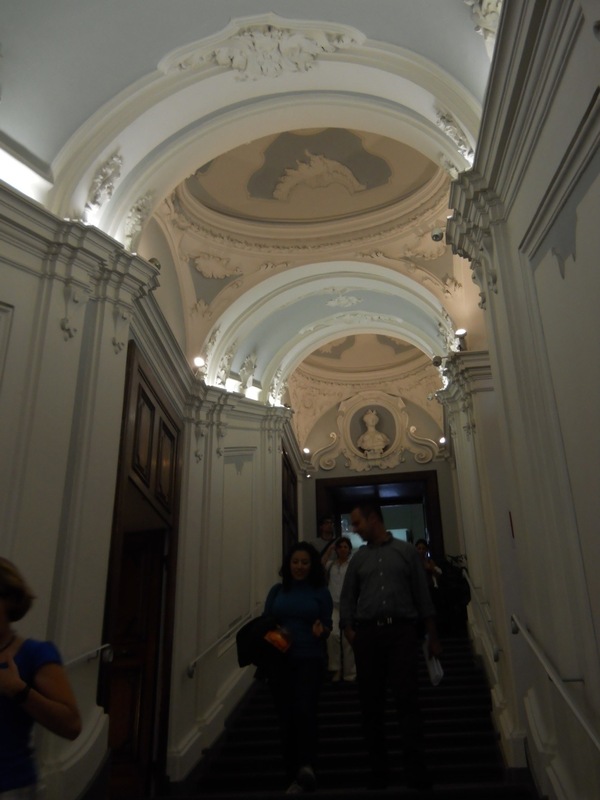 The interior photos are of my school, the Universita per Stranieri. 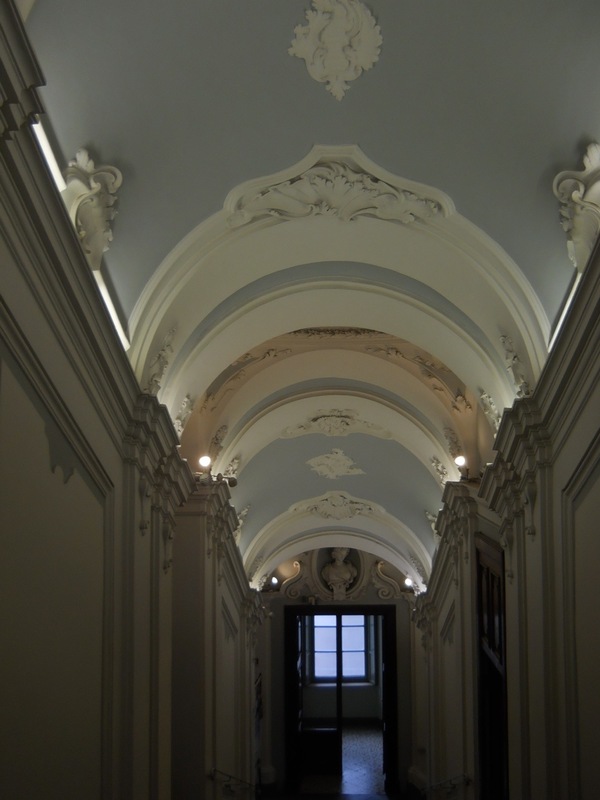 I only have one class in this building, but it’s an old palace, Palazza Galenga. The other photos are from a walk I took Monday. 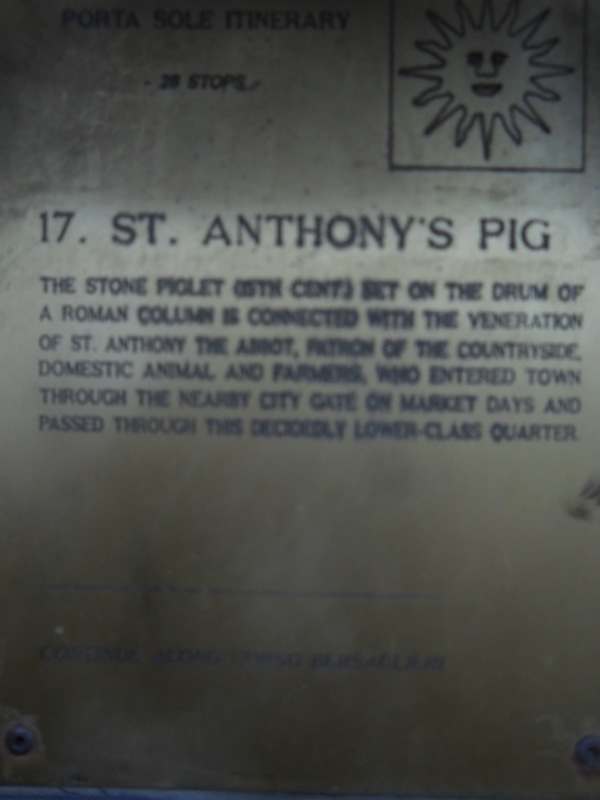 The pig is St. Anthony the Abbot’s pig. 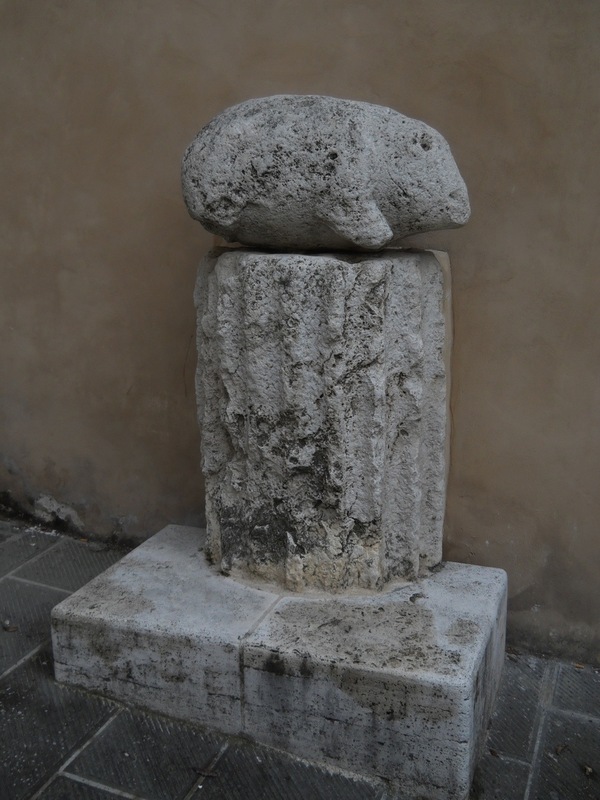 It’s from the 1400s and sits on a Roman column. St. Anthony is the patron saint of domesticated animals and farmers. I just stumbled across it. This town is amazing. My new friends have plexiglass over a hole in their floor. Beneath it you can see the remains of an Etruscan well. I'm a reader, writer, swimmer, and school librarian. I love my summers so I can travel. 1 Response to Non vivo lavorare ma lavoro vivere. i love the last picture!! someone else told us that quote too! !